Though I've never been a big fan of Valentine's Day, the idea for this just popped into my head the other day while procrastinating at work. 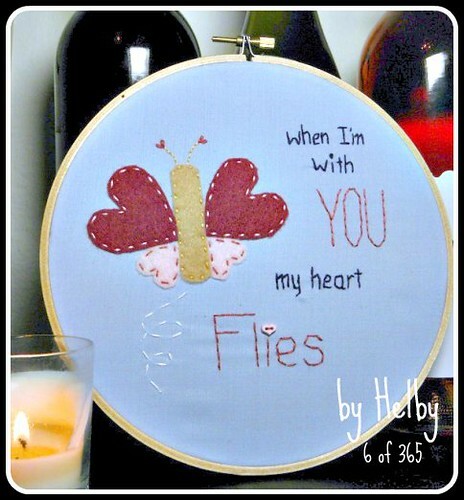 The butterfly is made of red, pink, and beige felt and stitched on blue cotton fabric with embroidery thread. This item on sale now in my Etsy shop. I've been collecting embroidery hoops from thrift stores. Your craft is inspiring me to dig them out and do some stitching. :) Well done. p.s. Saw your post at Fibers on Friday on Visions of Sugarplum's site. Just so adorable, and I love the sentiment!